9$ only for a limited time! Buy now! What is the Coinbase Payment Gateway plugin? 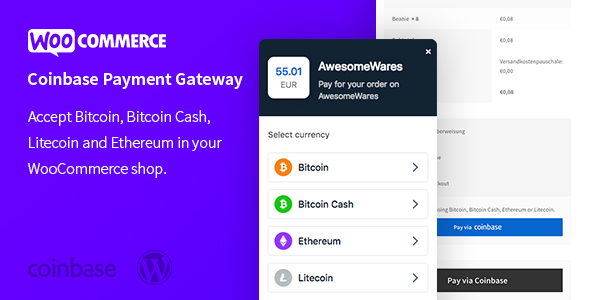 The Coinbase Payment Gateway WordPress plugin enables you to accept cryptocurrencies like Bitcoin, Bitcoin Cash, Litecoin and Ethereum in your WooCommerce shop! It utilizes Coinbase as the payment processor via the Coinbase Commerce API. Just like you would use PayPal to handle US dollar payments. The plugin nicely embeds Coinbase Checkout into your WooCommerce store, and makes cryptocurrency payments easy to use! Please keep in mind, that your site needs to support https in order to utilize Coinbase services. Give your customers an easy way to pay with cryptocurrencies! Wallets, payment detection and confirmation is being done by Coinbase – no hassle for you! Currently we only support English and German, but we’re working on translating it into Italian, Spanish and French!